In his earlier post, Yusuf Ahmed talked about what to expect in the Bangladesh apparel industry for 2018. According to him, 2018 will definitely be a good year, but 2021 will be a glorious year for Bangladesh and the Bangladesh ready-made garment manufacturing industry. The current Bangladesh government’s manifesto of Vision 2021 will come full circle and the country will be stepping into a new era of prosperity, not to mention the footprint it will have in this world. What does this mean for the Bangladeshi apparel industry though? Well, for one thing, the industry will not be the same. Bangladesh clothing manufacturers will be exporting more than $50BN worth of apparel and will remain the hot spot destination to source clothes from. These are just a few of the things to expect in 2021. The past few years, clothing manufacturers in Bangladesh have made strides to improve the circumstances surrounding the health and wellness of factory workers. A focal point of healthcare projects such as BSR’s HER project Health Systems Program, and more recently M&S’ (Marks and Spencer) project with Care International, has been about women’s health care. It is no secret that developing nations have a problem with women’s healthcare and it’s more profound when it concerns anything menstrual or obstetrical. But this industry has been pioneering healthcare innovation in the private sector and is a leading example of how to make it flourish. Take an example of Vintage Denim. This exemplary clothing factory in Bangladesh deeply cares for their workers, and healthcare is part of their company policy. Most clothing manufacturers in Bangladesh have a lot of red tape and bureaucracy when it comes to worker’s accessibility to top management. This makes it extremely tough for floor level workers to actually obtain the proper finances for their health care needs. Vintage Denim offers up to Tk 25000 per person or per family for their healthcare needs. That includes free basic check-ups and covers a lot of things from surgery and ambulance fees to maternity and obstetrical problems. There is even an option for paying back the company in installments if the costs are too much to bear. The factory actually reduced employee turnover by 30%. This is just one example though. SNV Netherlands Development Organisation is piloting a project with the support of the Embassy of the Kingdom of Netherlands, into an insurance scheme for the RMG industry. As the years will progress, expect an adoption of Universal Health Care across the industry. This is the something that is happening as a result of many different factors and forces in the overall ecosystem surrounding the Bangladesh clothing manufacturing industry. Bangladesh has been the darling of buyers from all over the world because of how low the cost of overheads can be to manufacture clothing. Because of this comparative advantage the country has monopolized the apparel industry in terms of low-end apparel. But with recent innovations in the industry, a lot of clothing suppliers have been sourcing some of their high-end apparel through Bangladesh clothing manufacturers. To name just a few brands are Hugo Boss, Ralph Lauren, and Emporio Armani. For a more comprehensive list, here are10 fashion brands manufacturing their apparel from Bangladesh. A lot of academic institutions have sprouted up to address the rising demand of apparel education as well. BGMEA (Bangladesh Garment Manufacturers and Exporters Association) has a pioneer institution called BUFT (BGMEA Institute of Fashion & Technology) and there are many other institutions both private and owned by the government. In the past, their aim was to just provide the basic education of merchandising but with the expansion of the industry the education curriculum has also expanded to include engineering concentrations, part-time intensive diploma programs, and even high-end fashion educations. The combination of education and the diversity of apparel buyers has forced clothing manufacturers to innovate and adapt to be more value adding. Concepts such as lean manufacturing have vastly improved efficiency and long gone are the archaic days of traditional production. Pathways have been made in the areas of quality control, merchandising, production, etc. By 2021, a large portion of clothing manufacturers in Bangladesh will be making clothes for high-end clothing suppliers, at a quality that is parallel with China and other countries with high-end apparel manufacturing. Bangladesh clothing manufacturers have recently begun a push to make their factories greener (Green Factory). Here are some facts that will change your mind about how eco-friendly the apparel industry in the country is: the top 3 LEED certified factories in the world are based in Bangladesh, the country has 7 out of the top 10 LEED certified apparel manufacturing plants, there 67 factories in Bangladesh that are LEED certified, and 222 factories are on their way to becoming LEED certified. The Bangladesh government is actually encouraging this trend as well. They are offering loans at an interest rate of 9%, much less than the national interest rate for any industry. Needless to say, Bangladesh shall soon become the country with the most environmentally friendly apparel industry and is an example for other developing countries that want to situate itself as an environmentally friendly manufacturer. These are just a few things to expect in 2021. Needless to say, time will tell what other progress the Bangladesh apparel industry makes. But one thing is for certain, $50BN is close within the grasp of Bangladesh clothing manufacturers. About the Author: Yusuf Ahmed is the chief supply chain strategist at NewThread. NewThread helps businesses establish an apparel supply chain here in Bangladesh by sourcing the right factory for the product from our network of certified factories, following up with inspections and shipment. 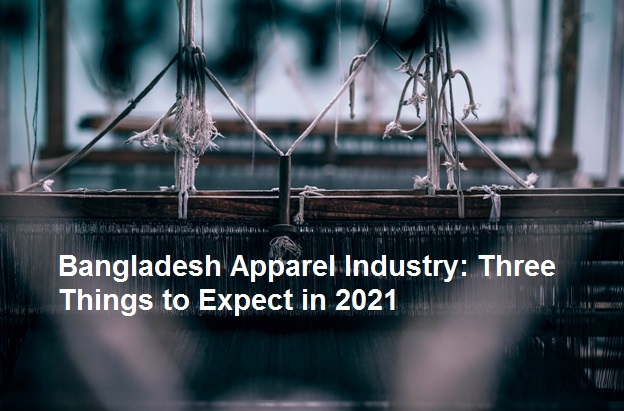 What to expect from Bangladesh Apparel Industry in 2021. Universal health care, High-end apparel production and Eco-Friendly Apparel Industry.